What does the scale reference mean? It represents a size of the model in proportion to the real machine on which it is based. Eg: 1/16 scale means it is one sixteenth the size of the real machine; while 1/64 scale means it is 1/64 the size of the real machine. 1/16 scale model is typically about 30 cm long. 1/32 scale is typically about 15 cm long. 1/64 scale is typically about 7.5 cm long. 4WD articulated tractors are somewhat larger and small tractors like the grey Fergy are somewhat smaller for the same scale. 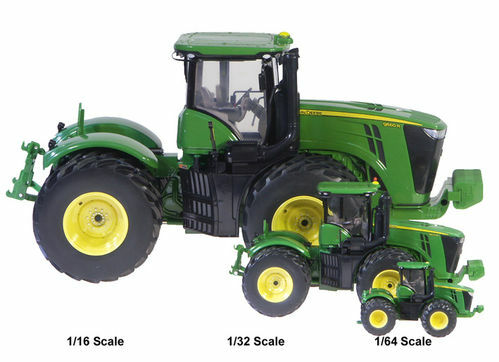 Eg: 1/16 scale 4WD articulated tractor = about 45 cm long. 1/16 scale grey Fergy = about 16 cm long. There are many other scales for the models, particularly earthmoving equipment and trucks which are typically 1/50 scale, and as the real machines of such models are quite large, a 1/50 scale model of such machines could be in the range of 20 to 40 cm long.